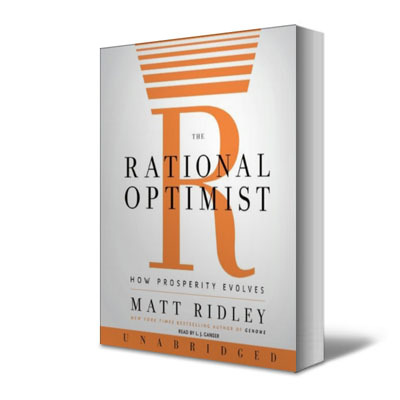 I’m currently re-reading Matt Ridley’s incredible book, the Rational Optimist. It’s another timely reminder that it’s very good to be a libertarian right now. In fact, being a libertarian has put you on the right side of history and reason since the dawn of mankind. What’s great for libertarianism, is that in the 100,000 year-or-so history of our breed of hominids, we have been winning the moral and factual argument in the real world. Our brand of reality is actually the real one, not merely the one that we’d like in theory to exist. Conservatives and modern so-called ‘liberals’ (I prefer the term ‘socialist’ or ‘social democrat’ to describe them) cannot – and have never really been able to – say the same thing. The moment homo sapiens first evolved from their homo dynamicus ancestors, we started to learn the relative value of trade (i.e. I value item A but I value item B a tiny bit more. For you, it’s the other way around, so we trade on mutually beneficial terms). In countless tests, our gorilla, chimp, bonobo and orang-utan cousins can’t pull off the same trick. None of the hominids before us could quite do it either. Our brains were about the same size as our father-species. We were weaker and not necessarily smarter than the neanderthals. But this understanding of trade was what separated us. It’s what made us the sucess we are today. And on it goes. Everywhere around the world, at an ever faster rate, the human race is living in an increasingly freer, happier, and more beautifully hyphenated and mongrelised world. Almost everything is getting better all the time. Or to state it differently, almost everything is getting more libertarian all the time. In fact, the only significant area where we seem to be losing the argument, is in the size and scope of the government. In the West, it appears that the unproductive sector is getting increasingly larger relative to the size of the productive sector. But libertarianism, like gravity, is a fact of life. And it will only be a matter of (possibly prolonged) time before this one minor blip in the libertarian road is finally paved over. The size of government will eventually have to come down, just as every aeroplane that has ever taken off has eventually had to land. The only real question is, will it be an orderly, rational and safe landing, or will it be a “brace for impact” kind of affair? I hope everybody comes to their senses long before we have to prepare for a bumpy fall to earth.